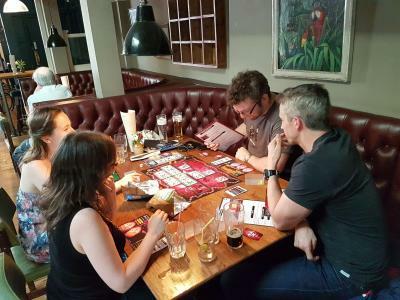 I’m the creator of Plague Inc. and this is part one of a blog series detailing the lessons I learnt when creating Plague Inc: The Board Game. Here I’ll focus on the Kickstarter process - how we built a successful campaign, and how we followed through on campaign promises. I’ll be posting the other sections - on Manufacturing, Fulfilment and Retail - soon. Every project is different and has its own unique advantages and challenges. Read this at your own risk and apply a lot of scepticism when considering how things might play out for your own projects! For example, one area in which I was very lucky was discoverability, as Plague Inc. is already a well known brand. 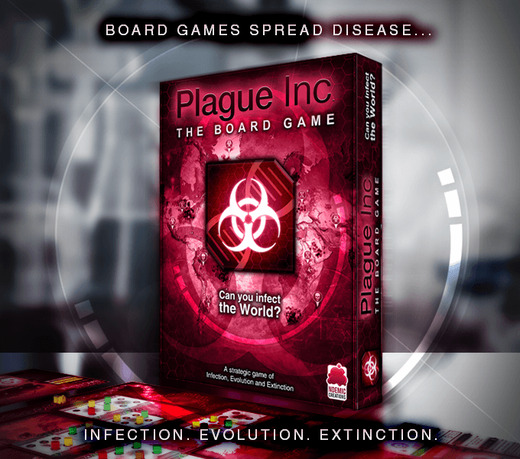 I spent over two years working on a board game based on my very popular video game Plague Inc. (imaginatively named Plague Inc: The Board Game). We did a Kickstarter campaign in May 2016 with a funding target of $34,000. It ended up raising $355,784 thanks to 6,509 backers plus an extra $41,136 in late pledges. 15,533 copies of the game were manufactured for our first production run - 48% for Kickstarter backers and the remainder to sell at retail. The game has been extremely well received by players and critics and we have now kicked off a second production run to replenish our fast-depleting stock levels (a nice problem to have!). Don’t make board games for the money! Making a board game can be wonderfully rewarding (and a lot of hard work!). However, it is extremely difficult to make money from it (but the market is growing significantly). If that is your main motivation you may end up disappointed. For me, Plague Inc: The Board Game was a passion project - I wanted to turn my ideas into a real, physical game that I could play with friends. Any money that it made would be a bonus and not something I took for granted. 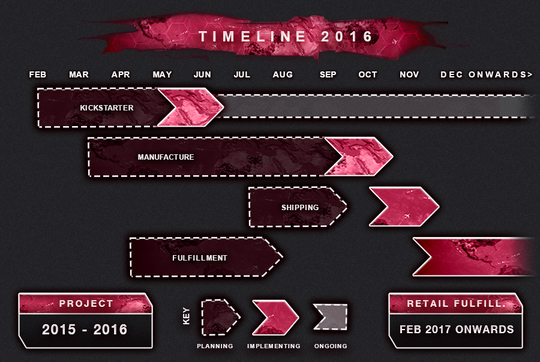 A Kickstarter campaign is a significant time/cost commitment and it’s important to plan it properly. At Ndemic, we spent around three man-months on the text, graphics and planning of the Kickstarter before it went live (this could have probably been reduced :P ). We then spent one man-month during the Kickstarter campaign itself and two man-months post Kickstarter (on updates, processing backer orders, dealing with any other issues, etc). The Kickstarter video cost ~$7,000 (filming, editing and visual and sound assets but not our own time). For us, Kickstarter wasn’t just about raising money - the community that it develops is just as valuable (if not more so!). This was such a new and different project for me and I wanted to get backer feedback on every aspect of it as well as understand what was important for them in the game. (e.g. I designed a single player mode due to backer feedback). It would also give me reassurance that people wanted a board game based on Plague Inc. and give me the confidence to place larger order volumes to let us benefit from increased economies of scale during manufacturing. As I said above, making the board game was never about making money. I’d already spent years of my life working on it and I definitely wanted to get it made! I decided to set the funding goal as low as I possibly could to cover a production run without me risking too much money. An added bonus of this approach is that if the project went well, it would be significantly overfunded which can help attract additional attention. You have to have a clear view of costs in order for you to properly set your pledge tiers and shipping costs otherwise you’re exposing yourself and your backers to significant risk. We asked our manufacturer and fulfilment partners for multiple quotes covering different scenarios (including potential stretch goals) and then applied a significant margin of error to our calculations. This meant that when various hidden costs popped up we were able to deal with them without issue (e.g. increased container ship rates due to shipping company bankruptcy, spare parts international postage costs, delivery issues to Russia / Brazil). These are brilliant ways to quickly show people key aspects of your game on your campaign page. All campaigns should use them. An example of a GIF animation from our Kickstarter campaign page. Videos of the game being played are essential - especially for regular board game backers. I recorded our tutorial video the night before the campaign went live using my phone and a clothes drying stand! It took about five hours of retakes to get 25 mins of video and I finished at 3am :P It was absolutely worth it with 17,812 people watching it during the campaign (40k people have watched it now so it continues to be useful well after the campaign has finished). A lot of backers want to see the rulebook to check that this is a game that they will enjoy playing. As a bonus, you can get backer feedback on the wording of the rulebook and their questions can help identify areas where the rules need to be clarified / altered. One of the best things about using Kickstarter was the direct line it gave me to our community. It is a huge privilege to have fans who are prepared to share their thoughts and opinions about a project. We responded to every single player comment that we received - this helped people feel positive about the project and it also gave me a wonderful insight into what people cared about. Plague Inc: The Board Game has a single player mode, but this wasn’t always going to be the case. We had a backer poll where players could let us know what they wanted in the game and it quickly became apparent that many fans really wanted a solo mode. So I got my notebook out, sat down, and designed one (harder than it sounds!). The PlagueBot solo mode ended up being extremely popular and I was able to implement it in such a way that it had a negligible impact on production costs. Without Kickstarter, and the community it allowed me to speak directly to, this mode simply wouldn’t exist. Stretch goals should be planned and costed before the campaign starts. All ours were unlocked way quicker than I expected and there was a significant temptation to add new goals in order to keep backers engaged. In the end I decided to focus on delivering the project to a high standard within our agreed time frames*. The decision and reasoning was clearly communicated to backers and everyone was extremely supportive of the approach. We ended up raising 33% of our campaign funding ($115,784) excluding late pledges after all the stretch goals had unlocked - our campaign did not suffer at all. I’m not sure it is worth letting backers order multiple copies of the game (unless it is very easy for you to do logistically). It seemed like quite a few backers wanted this option but it took quite a lot of effort to lock down the additional shipping costs and at the end of the day - only 50-100 people actually ordered a second copy. I think my time and effort would have been better spent elsewhere (potentially I would still include it as an add-on option after the campaign). Backerkit is a third party tool for managing backers and their pledges and it is wonderful. I was quite sceptical of using it initially (as an excel wiz - I thought I could handle it all internally) but it saved so much time and also allowed us to smoothly deliver late pledges, add-ons and upgrades for backers too. It resulted in an additional $40k for the project easily covering their fees (and that doesn’t even place a value on the time saved!). Thanks everyone at BackerKit - in particular Tommy Hall for encouraging me to try it out. TLDR: Backerkit made us money, saved us time and improved our backer experience. It took a lot of time and energy shipping to certain countries that have unreliable postal systems (Russia and Brazil in particular) and we ended up losing money on shipping costs to these countries. It is a tricky situation as I wanted to give all fans the option to back the game but I would consider restricting delivery options to certain countries in the future as my time would probably have been better spent elsewhere. If a backer wants a refund - try to give it to them within 14 days of the project closing (through Kickstarter) and you will not be charged the Kickstarter fee on that amount. 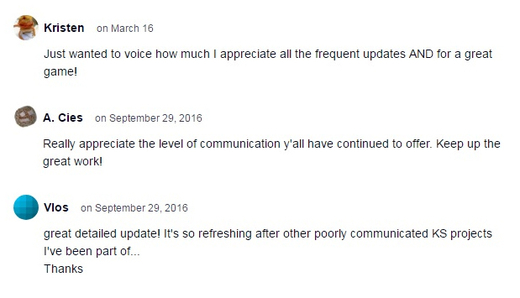 Keep the community regularly updated!!! This is such a huge point and so important, yet it often doesn’t happen. Talk to your backers and keep them informed on what is going on. Backers are your most passionate fans and they want to know how the project is going. It can be tempting to wait until you have ‘good’ news to share but this can very easily lead to you not saying anything at all. I openly told people about issues we were having in manufacturing and potential shipping delays and the response from backers were immensely supportive. We ended up with a powerful, positive group of people who helped get the word out about the game when it hit retail as well. All in all, 99% of people said they would back us on Kickstarter again and 99% also said our communication was ‘Good’ or ‘Really Good’ during the campaign. You can find the full results in swish infographic form on our Kickstarter page here. I hope you found this useful. Next up - I’m going to do a post about our manufacturing process and partners and after that we’ll look at how we handled fulfilment, distribution and selling at retail - so keep an eye open!